Are You Really Going to Eat Those Mushrooms? Chlorophyllum molybdites, the green-spored lepiota, was the mushroom du jour. Three of the cases involved this toxic mushroom that is commonly found in yards after summer rains. It looks lovely, and it usually won’t kill you, but I’m told that it makes one sick enough that people think that they might die. Symptoms involve vomiting and/or diarrhea, often severe, starting one to three hours after ingestion. This is the most commonly eaten toxic mushroom in the United States. 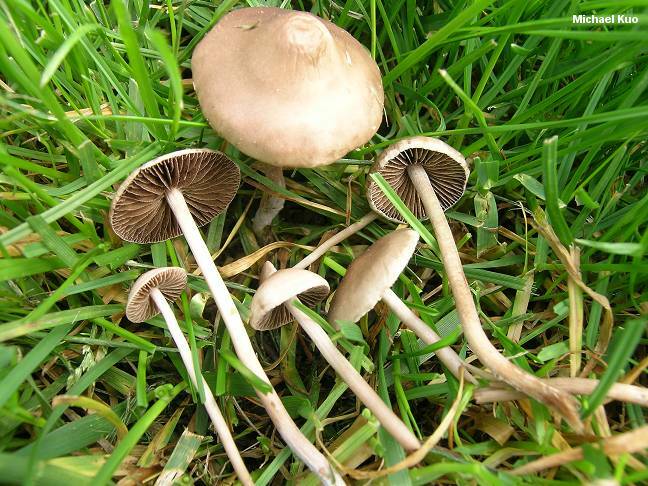 It might seem like a bumper crop of free eats in your lawn, but Chlorophyllum molybdites is toxic. Today’s other culprit was Panaeolina foenisecii, known as the lawn mower’s mushroom, also commonly found growing in lawns. Unlike Chlorophyllum molybdites, this is no beauty. It is an LBM (little brown mushroom). It too can cause gastric upset and has been reported to cause slight hallucinations in some cases, but never in the numerous cases in which I’ve been involved. Not all mushrooms growing in lawns are toxic. But the only way to tell is to know what the mushroom is (identify it). There are no short cuts or tricks to knowing whether a mushroom is toxic or not, so think before you eat! There are a number of mushroom books that can help (I’m partial to Wild Edible Mushrooms of Illinois and Surrounding States by my colleague Joe McFarland and me). And a great way to learn mushroom identification is to join a club like the Illinois Mycological Association. Identifying mushrooms and plants for the Illinois Poison Center and hospitals is something that I and other Chicago Botanic Garden staff gladly do. Freely sharing our expertise is part of the Garden’s commitment to the region. Posted on June 30, 2014 June 27, 2014 Author Greg MuellerCategories Horticulture & Display GardensTags chlorophyllum molybdites, green-spored lepiota, lawn mower's mushroom, lawnmower mushroom, mycology, panaeoline foenisecii, poisonous mushrooms, toxic mushrooms, wild edibles3 Comments on Are You Really Going to Eat Those Mushrooms?